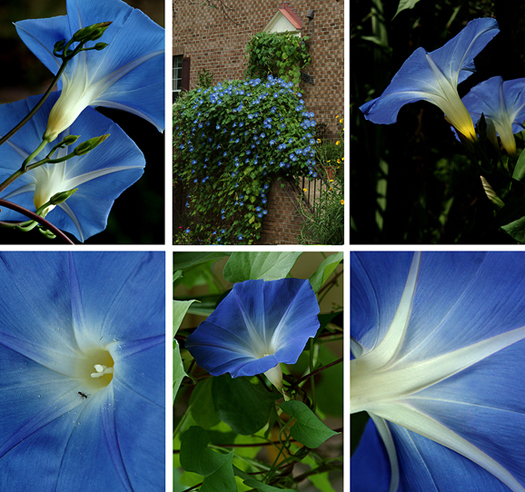 The top middle image is a shot of the massive morning glory takeover of the side of the house last year. The morning I shot this I counted over 300 blooms. It is truly a sight to take your breath away! On Saturday morning Regina and I attended a walking lecture/garden tour at Green Spring Gardens. The lectured was entitled, “Plants that Sizzle, Not Fizzle.” We were introduced to many plants both famliar and not (and Regina and I were quite proud that we could both spout off names of the majority of them 😉 We took home a checklist of plants that can withstand our heat and do well in drought conditions. We also got to take home free plants. And, of course, I had to bring all my camera gear. 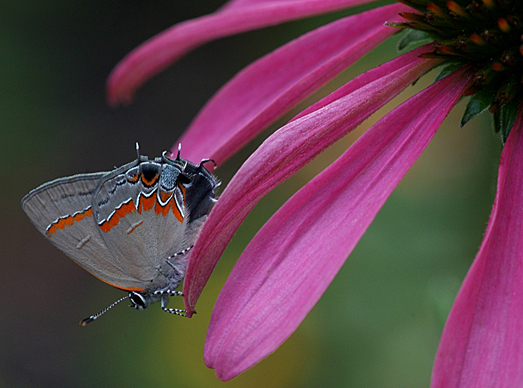 Sherry, a gardener we met on the walk, pointed out this unusual butterfly on a coneflower in one of the demonstration gardens. It was such a strange looking thing (the butterfly, not Sherry! )….both ends appeared to be moving and we couldn’t tell which end was the head…it appears to have two heads with antennae at both ends. FYI…if you’re ever curious about a bug and are just itchin’ to identify it (who wouldn’t be? 😉 this is a great site that I use frequently. This link will lead you to a shot of the same butterfly I photographed. Jeff and I took a photo road trip over to Kenilworth Gardens this morning…while the weather was perfect for humans (sunny but not hot), the breezes made it difficult for photographs! These are a few of the shots I was able to get when the breezes took a break….my jaunt there last year (as well as the year before that) was more fruitful, photography-wise. And since we were delayed by the drawbridge going up on the Woodrow Wilson Bridge, we got there later in the morning than expected, so the harsh sun was also not conducive to garden photography….but I did get some nice ones. If you haven’t been, it’s really beautiful when the lotus plants bloom in mid-July (http://www.nps.gov/keaq/). 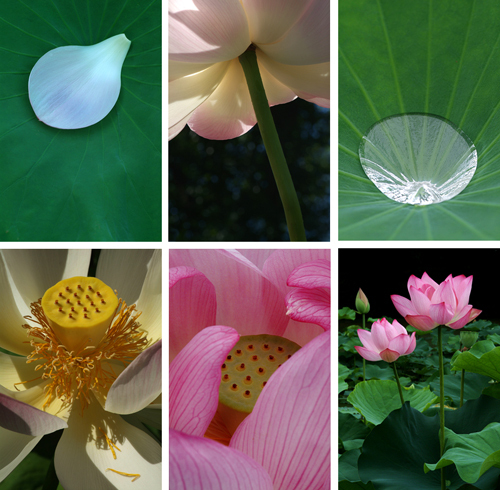 Mary Ellen (www.happytonics.org), you will be pleased to know that milkweed grows alongside the lotus ponds like, well, WEEDS! And we saw several Monarchs, as well as female and male Eastern Tiger Swallowtail butterflies, taking advantage of this very important plant. One of my favorite insects to photograph is the fascinating praying mantis. They are very still, waiting for their prey, making them quite easy to photograph. I did some research and found this very useful Web site below. 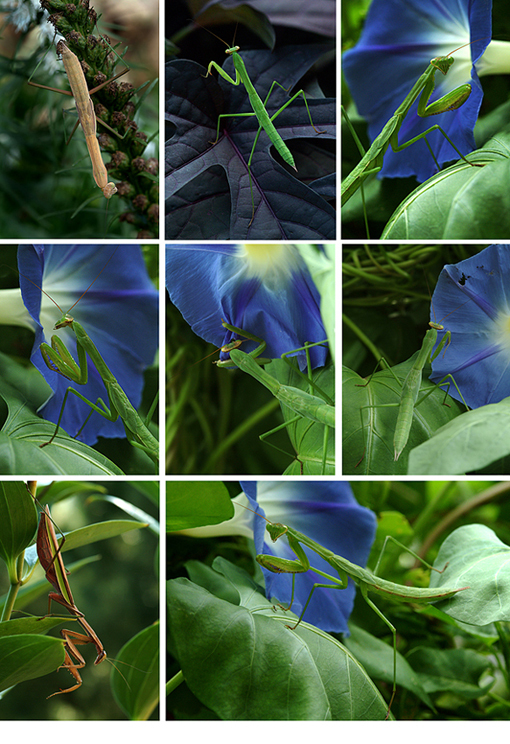 I just love the site’s name—”insecta-inspecta.” See the center triptych? I watched this mantis for several minutes…then he reached over and grabbed the morning glory (presumably going after the myriad ants that love this plant) and left a hole after devouring his prey. (Hmmm….so that’s how those holes come to be!) It was good photographic luck to be able to witness and successfully photograph it. And, speaking of praying mantis, this afternoon Gina and I stopped by Home Depot on Route 1 to look at the plant selection…there were some items on sale and when Gina reached up to check them out, she encountered a rather large green and brown praying mantis (he looked just like the mantis below–bottom row, far left). Figuring someone would buy the discounted plant sooner than a regular-priced plant, I took the plant he was on and embarked on “Operation Mantis Relocation.” I leaned the plant over a tall sedum (which I know they like since I’ve photographed them on sedums in our garden) and he casually sauntered onto it. It’s all about location, location, location!